New Hampshire is a perfect place for boating; our state has over 400 public state-owned launch sites for boating, kayaking, or canoeing. But when boaters fail to follow safety laws and guidelines, boating can quickly turn from a fun to a dangerous activity. 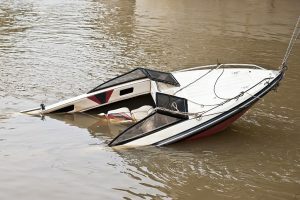 Earlier this month, a New Hampshire man was killed when in a boating accident upstate New York when his powerboat hit a rock. Allen Lighthall was boating with his 13-year-old son when the powerboat hit a rock in the lake, throwing his son into the water. Lighthall dove in after his son. Another boater in the area saw the accident and was able to rescue the 13-year-old, but Lighthall did not survive. Also this month, a kayaker was fishing in Lake Massabesic when a powerboat struck him, expelling him kayaker into the water and causing serious internal injuries. In 2015, there were 4,158 boating accidents resulting in 2,613 injuries and 626 fatalities. Most of the accidents, injuries, and deaths occurred between the months of May and September. Collisions, either with other vessels or with fixed objects like rocks or docks, are the most common type of accident. Boating accidents are particularly dangerous because victims can drown when injured on the water. Boaters are expected to follow New Hampshire marine laws. Failing to do so will result in fines and penalties, and can make the boater liable for the injuries of others. Boating laws and regulations differ in each state. In New Hampshire, all boaters over 16 years of age who will operate a vessel are required to complete the New Hampshire Department of Safety Boating Education Course and pass an exam. New Hampshire also accepts boating education certificates from other organizations like the US Coast Guard, and the US Power Squadron. Anyone under the age of 16 who is operating a vessel must have a passenger over 18 who has a boating education certificate. 71% of all boating accident deaths occur on boats where the operator had not previously received boating safety instructions. Only 15% of boating accident deaths occurred on boats where the operator received some kind of nationally approved boating safety education certificate. Boaters in New Hampshire that are under 5 years of age are required by law to wear an approved flotation device. While other boaters are not required to wear a flotation device, it is strongly encouraged. 85% of boating accident victims that drowned were not wearing life vests. About half of all child fatalities involved drowning. All boaters in New Hampshire are required to register their vessel with the Department of Motor Vehicles.